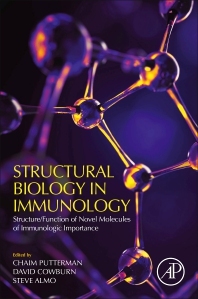 Structural Biology in Immunology, Structure/Function of Novel Molecules of Immunologic Importance delivers important information on the structure and functional relationships in novel molecules of immunologic interest. Due to an increasingly sophisticated understanding of the immune system, the approach to the treatment of many immune-mediated diseases, including multiple sclerosis, systemic lupus erythematosus, rheumatoid arthritis, and inflammatory bowel disease has been dramatically altered. Furthermore, there is an increasing awareness of the critical role of the immune system in cancer biology. The improved central structure function relationships presented in this book will further enhance our ability to understand what defects in normal individuals can lead to disease. Dr. David Cowburn is Professor in the Departments of Biochemistry and Physiology & Biophysics at the Albert Einstein College Of Medicine, David Cowburn's research centers on the application of structural biology, and particularly, nuclear magnetic resonance (NMR), to biological problems. He was a faculty member at Rockefeller University 1973-2000, and served as the start-up President and CEO of the New York Structural Biology Center, 2000-2010. http://cowburnlab.org/DavidCowburnFullBio.pdf.